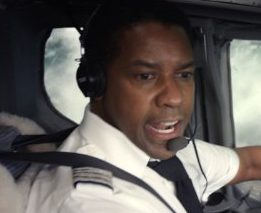 Flight is about Whip Whitacre (Denzel Washington), a seasoned commercial airlines pilot who is in denial about having a substance abuse problem. His ex-wife and son don’t want him around. No one he works with who knows him expects him to change, although one stewardess and friend he flies with who goes to church regularly (Tamara Tunie) keeps a pew warm for him. Whitacre is a gifted pilot, but he is also a gifted liar when it comes to not letting others know about how bad his problem is. Everyday is just another day, another day to start over doing what he did the day before. His grandfather left him a farm. Grandpa was also a pilot. What he left to his grandson is a place now filled with alcohol, but like many alcoholics, he sometimes cleans house. It’s like a part of him wants to start over. Whip meets “Nicole” (Kelly “Sherlock Holmes” Reilly) in the hospital after the big crash. She definitely wants to start over. She doesn’t want to shoot up anymore. That was why she was admitted to the hospital in the first place. As they are both facing an existential look inward, the investigation into the crash is well underway. The world wants to know what happened up there and if Whip had been drinking. What makes Flight such an incredible film is that moral choices are involved. These choices have consequences. They come in the form of honesty and self-examination. No matter your religion or lack thereof, every human being can and should be touched by the subject matter. After reviewing movies for a while, I can say that movies with redemption at their core are the ones that stay with us the longest. To go with one of the best performances by Denzel since Man on Fire (2004), we have several appearances by John Goodman as “Harling Mays,” a long-time friend and Whip’s worst enabler (drug supplier) who is both obnoxious and hysterically funny at one and the same time and in every scene he’s in. It’s hard to hate him, especially when he so well does what any user/enabler does as they use any occasion as a means to break out the hard stuff: “You’re a hero, man! You’ll never buy another drink as long as you live!” He tells Whip. It’s time to celebrate! Denzel took great care not to overplay his character’s reckless self-abuse (a thing often not done quite right in movies where addiction is in focus) along with Reilly who stays well within the parameters of her always submissive and soft character. They would have had a hard time selecting a better performer for the part. It is not often in movies that a second-to-lead character is as well mapped out as the part she plays, but all characters in the movie could be held up as stellar examples in a character study due to their well-foundedness. Whip’s friend and union representative of many years is “Charlie Anderson” (Bruce Greenwood). 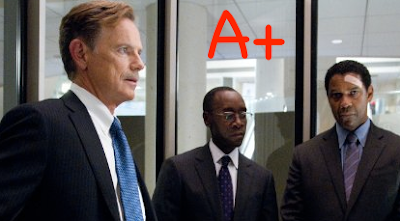 Charlie is seeing him through the investigation and has recruited “Hugh Lang” (Don Cheadle), a more than competent legal mind who fights on his side. But with the causes of the crash under growing scrutiny, it will ultimately be up to one man to reveal to the world what really happened on Flight 227. Flight is a great movie and not just because of its human-relevant subject matter or because of the pull-back it employs in bringing the story and character elements up with great detail and credibility, but because everything about it serves as a commentary on the human tendency to lie. Zemeckis (Back to the Future, Polar Express, Castaway, Beowulf), who is certainly no newbie, here utilizes unbecoming skill in the small examples of misdirection he throws our way. This film may leave a sour taste in the mouths of those who have been through the ordeal of addiction with an out-of-control family member. I’ve been through it. I’ve seen what drugs and alcohol can do to a loved one. But redemption, the subject just never gets old. It means too much. There isn’t a human being on the planet that can fail to relate on some level.